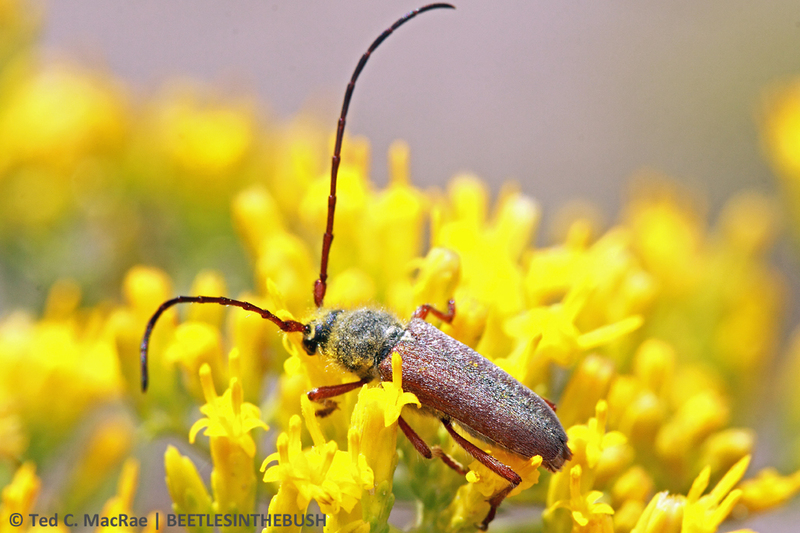 On Day 7 of last August’s Great Basin Collecting Trip, we left Bishop and headed back north to the Mono Basin to look for Crossidius hirtipes rhodopus, a distinctive reddish subspecies known only from the Mono Basin. I’d seen this beetle before—almost 20 years ago during one of several trips to the type locality of Nanularia monoensis (described by my late friend Chuck Bellamy in his 1987 revision of the genus), so we drove south of Mono Lake on Hwy 120 through Adobe Valley on our way to the Benton Range where I last saw them. Of course, C. h. rhodopus occurs more broadly in the Mono Basin than just the Benton Range, and as we drove through the valley we saw robust stands of the beetle’s host plant, yellow rabbitbrush (Chrysothamnus viscidiflorus), in full bloom stretching across the floor of the valley to the towering White Mountains in the distance. Impatience can sometimes be a virtue, and in this case our decision to stop and check the plants rather than waiting until we got to the Benton Range paid off—not only were the beetles out in force, allowing us to photograph and collect to our heart’s content, but we saw only a few beetles on but a single flowering plant during our subsequent visit to the Benton Range. Apparently the rains that had caused such a profusion of bloom in the Adobe Valley had not graced the Benton Range, resulting in the driest conditions I have seen during my several visits there. Crossidius h. rhodopus is among the most distinctive of all the C. hirtipes subspecies due to its dark reddish-brown coloration. It closely resembles C. h. nubilus, which we had seen the day before at its only known locality further south at Westgaard Pass between the White and Inyo Mountains, but it is not as dark as that subspecies and lacks the extensive clouding of black on the apical portions of the elytra. The red-brown legs and brown antennae becoming darker at the tip further characterize C. h. rhodopus, originally described as a full species (Linsley 1955) but later regarded as a subspecies of the widely distributed and highly polytopic C. hirtipes LeConte, 1854 (Linsley & Chemsak 1961). 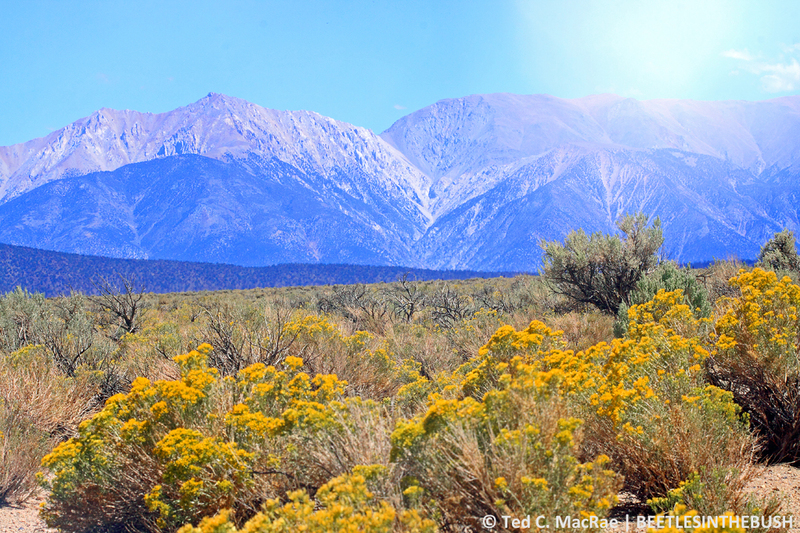 Yellow rabbitbrush (Chrysothamnus viscidiflorus) abounds below the magnificent White Mountains. Those who are unfamiliar with the Mono Basin are missing one of California’s greatest natural treasures. A closed, internal-drainage basin bordered to the west by the massive Sierra Nevada Mountains (with Yosemite National Park lying just over the peaks), to the east by the Cowtrack Mountain, to the north by the Bodie Hills, and to the South by the north ridge of the Long Valley, the eerily beautiful Mono Lake is its most prominent feature. Do not, however, neglect other areas of the basin, which offer their own uniquely dramatic beauty. Adobe Valley, stretching south of the lake towards the White Mountains and famous for the wild mustang that live there, is one such area. A robustly handsome female perches a terminal flower cluster of yellow rabbitbrush (studio shot). Linsley, E. G. 1955. Notes and descriptions of some species of Crossidius. The Pan-Pacific Entomologist 31(2):63–66. Linsley, E. G. & J. A. Chemsak. 1961. A distributional and taxonomic study of the genus Crossidius (Coleoptera, Cerambycidae). Miscellaneous Publications of the Entomological Society of America 3(2):25–64 + 3 color plates. 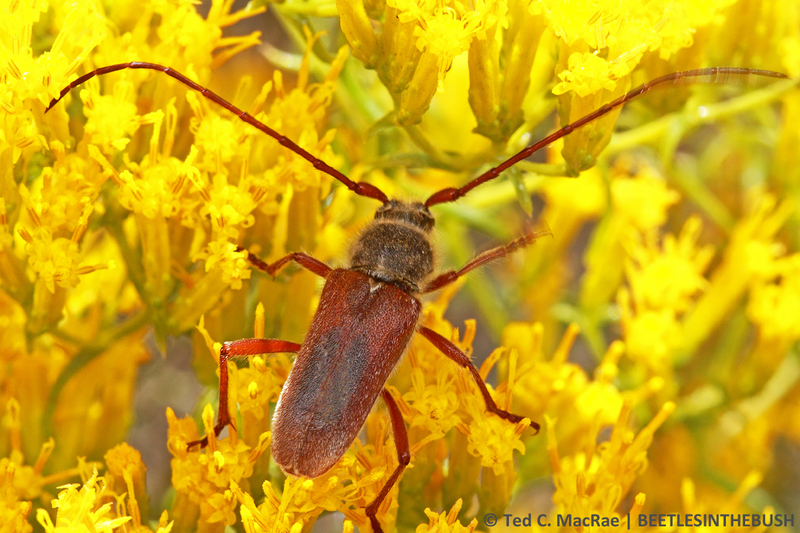 This entry was posted in Cerambycidae, Coleoptera and tagged beetles, California, entomology, Great Basin, insects, landscapes, longhorned beetles, nature, science, taxonomy. Bookmark the permalink. I got my specimens of this subspecies near Lee Vining, CA. We looked around Lee Vining and some other spots along Hwy 395 and didn’t find them, which is one reason why we decided to head down to the Benton Range where I had seen them before (the bigger reason was to look for Nanularia monoensis, which we did not find). I suppose occurrence depends greatly upon the rains, but when they do occur they can be quite abundant. I’m actually going in a few weeks – any early season inverts to look for?